My initial review of Rod Bennett's book, Four Witnesses at Amazon. Please read the review at Amazon first. (April 17, 2017: I noticed my review is no longer there at Amazon. I wonder what happened?) Fortunately, I saved a copy on my computer. Addendum: My review is still there; but see explanation below at Apologetics and Agape"
Reprinted here at "Apologetics and Agape". I will be improving upon this, Lord willing, as time allows. 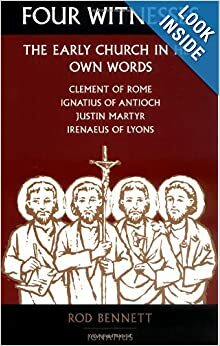 This book and my friend's conversion to Rome in 1996 was one of the main reasons I sought to understanding early church history and the early church fathers better, and apologetic answers to the issues that Rod was bringing to me. A few months after I returned from the mission field in Turkey, he called me (I think, it was sometime early in 1996 ? I cannot remember exactly) and invited me and my brother to his house. I had just been reading R. C. Sproul's book, Faith Alone. It was a real shock when he announced he was converting to Roman Catholicism. We then had 8 years (1996-2004) of informal debates by sometimes 5 hour discussions, lunches, emails, phone calls, etc. Then, sometime in 2004, Rod told me he did not want to "debate" or discuss theology anymore. I was motivated to find answers, even though I basically knew that Roman Catholicism was wrong; I was seminary trained afterall (smile), and thought I had a fairly good grasp of church history. However, 3 courses in church history does not adequately prepare one for these arguments that most Evangelicals had never heard before. Rod was using a lot of Cardinal John Henry Newman and his "development of doctrine hypothesis" and other former Evangelical Protestants like Scott Hahn and similar arguments that other Roman Catholics, both former Evangelicals and cradle Catholics make, like Jerry Matatics, Jimmy Akin, Patrick Madrid, Mitch Pacwa, Robert Sungenis, Tim Staples, Peter Kreeft, Kenneth Howell, the Surprised by Truth book series, Karl Keating, Catholic Answers, etc. were making. That is what motivated me to find Dr. White's materials, web-site, and debates (around 1996), and James Swan's work here, and other good answers by William Webster, David King, Eric Svensen, R. C. Sproul, John Bugay, and Jason Engwer, Steve Hays, and others at Triablogue, Keith Matthison, Turretinfan's blog, and Michael Kruger's material on the canon. Since that time, there has emerged other Evangelicals converting to Rome, such as the Called to Communion web-site and other folks like Jason Stellman and Frank Beckwith, also making the same basic arguments. A lot of the issues of church history, also came up when I was witnessing to Muslims. Muslims have questions about the canon, the early church, and the doctrine of the Trinity. The convergence of these issues and connections to Roman Catholic claims made the subject very interesting to me and strengthening in dealing with Muslims in evangelism and apologetics. I have waited a long time to publish this, because I never wanted to hurt Rod personally, and, the biggest reason, is that I also felt I really needed to study the issues deeper. I hope anyone and everyone who comments will keep the discussion to the issues and not go ad hominem or bombast on either side. I will delete any comment I think is mocking or bombast or ad hominem or off topic. Another reason I have not done this before is that I personally think some on my side are too hot-headed and mocking; and that is not a good witness for Christ. As an additional note, I really appreciate what Dr. White has been saying recently on recent Dividing Line programs; to some other Reformed folks who go overboard against Arminians and Charismatics and those that are not balanced when dealing with Muslims and Islam. We need to both stand for the truth and be godly in our behavior. Let that be a warning. Please pray for Rod Bennett. If and when Rod sees this, I hope he will see my efforts are focused on doctrines and principles and issues, historical facts, and not ad hominem attacks. 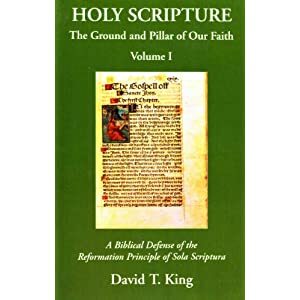 This book has been promoted by Roman Catholics in these years since it came out as a basic introduction to the early church fathers and early church history and is widely acclaimed by most everyone who has read it. There were not many negative reviews of the book before mine, at Amazon. I am unaware of any other reviews of the book. You will see in my initial review, I focus on the material in his sections in Clement and Irenaeus that Rod left out, that if he had included that other material (just let the quotes go a little bit farther), the argument would favor a more Protestant way of understanding early church history. I believe that there are good answers to the claims theses Roman Catholics make for the early church. The early church was not Roman Catholic, nor Eastern Orthodox, nor Protestant, but "catholic" (universal). As Dr. White has said many times, "we can let the early church be the early church". Except for baptismal regeneration, none of the dogmas or doctrines that Rome claims were there, were actually there, in the same way that Rome promotes them today. (Baptismal regeneration is the one belief in the early church that seems to be there; but without the ex opere operato RC take on it; but, even then, I sincerely believe that the early comments and interpretions on John 3:5 and Titus 3:5, and related passages, etc. were wrong on that issue. It was a wrong interpretation of the Biblical texts.) We discussed that issue before at length. And let's not beat that horse again here, please. Just becasue the early church used the words "catholic" or "eucharist" or "tradition" or "bishop", etc. does not mean what Rome claims they mean. I have not taken the time to look into that phenomenon on Amazon. I may try to explore around and see what you are talking about. But the last 25 years or so, with Scott Hahn's "Rome Sweet Home" etc., there has definitely been an explosion of RC apologists and websites and books; and as you say, "most evangelicals are under the influence of ECT" (Timothy George type view) or Norman Geisler's view; there are fewer and fewer consistent believing Protestant/Evangelicals. I am not familiar with your friend's book, and I look forward to reading your review. If Mr. Bennett has a website or excerpts of his book online, feel free to link them as well. He used to have a blog, but he shut it down (maybe 2 years ago ? ; I cannot remember). Also, Rod Bennett edited Gary Michuta's book, "Why Catholic Bible's are bigger". He has written other various articles on different Roman Catholic sites. Ken... part 2 any time soon? Rod Bennett edited Gary Michuta's book, "Why Catholic Bible's are bigger"
I had not realized that. I may have come across Rod's book at some point. There was a Borders Books near my house that had a supply of pop-Romanist stuff. I would go over there from time to time to what was being published.